School holidays are here - it's the end of the school year and we have 7 weeks of hols till school start in Jan. The boys are home - and that means trouble!! Well, I've been getting like 10 calls in one morning when I'm at work - to settle disputes, listen to their complaints about the other, trying to make things "fair" ..etc! I need to find them something to do! Then I had a great idea, for 3 days they sorted through all their toys, into piles to give away, to throw away, and into neat / sorted to play piles. I told them if there is no space for new toys, then there will be no new toys (for christmas)!! It worked! To their surprise they found so much they thought were gone forever, or had even forgotten. Jared found so many of his Lego mini-figures, he was delighted! And I had fun too playing mix and match with their hats, weapons, body suits, etc... haha this is the lot of the poor mama who has no daughters nor barbie to play with . lol! Well, I am really coming to the end of my US trip photos. In fact, just in time, because in 10 days we are leaving for our first ever trip to Japan!! !I know it's recession and all that, but we booked it before the financial crisis played out, and also we had frequent flyer miles from our last trip, so it was not as expensive as it could have been. And we really scrimped and saved for it! 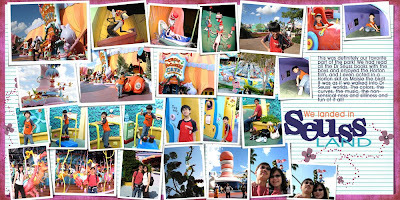 These photos are from our last day at Universal Studios - the wonderfully whimsical Dr Seuss Land. Credits: Pink paper by Ziggles Designs, lined paper by Robin Carlton, alpha by Lauraskathi, flowers by cinnamondesigns. I like double pages because they're more versatile -- can use them as a double or just use one or the other as a single. Awesome layouts Yin! I've enjoyed them all and even noticed you had been published. When I was flipping through my magazine I spotted your work immediately! Congrats on that! Thanks for the template!! I really need to get over to your store soon! Single or double...doesn't matter, I love them both but if I HAVE to choose I say double! Yin, thanks for another great template. I have no preference since I scrap both one and two pagers. 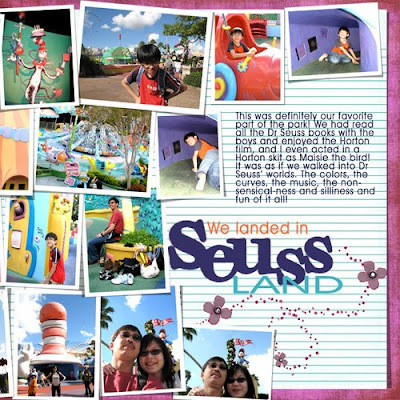 I love your Seuss Land layout. Have a wonderful trip to Japan. We lived in Tokyo for two years with our four kids due to my husband's job and loved it!There is so much to see and do there and I look forward to seeing your pictures. Thanks for the template. I look for double page templates mostly but an occasional single page one is great. I can usually use one of the two pages of a double with slight rearrangement. Please, please, pretty please could you do some 8 1/2 x 11s in the fuuture. In portrait mode, not landscape. I like that size because I can print it myself and the 3-ring binders of that size are making a comeback. Hooray!! Double, double, double, please please, please. Thanks so much for the fabulous templates and great ideas on your completed pages. Thanks. Your templates are just the best! I prefer doubles usually. I take so many photos for each occasion it's hard to narrow them down. Thanks for sharing! Thank you so much for another great template. I like both single and double; however, I personally don't use the double templates that have a picture "in the middle" -- in the crease of the page -- not sure how to describe it, but I personally don't care for the picture to span both pages. And that's just one person's opinion. But otherwise, I like double and single both. And I like all your templates and their lovely simple graphic design. Thanks for another wonderful template!! I really prefer the double pages. They are so hard to find. You can always just use one side or the other if you only want one page. But even if I have different subjects on each page I still want them to look like they belong together in the album. And I so love your style because I usually have lots of pictures to fit on a page. I'm not as into the "white space" pages. Although a lot of them look nice, but mine are all about the pictures! Thanks for sharing the single pager. I REEAALLYY love the two pager best, however. I love to jam my pages full of photos. One or two photos on a page just doesn't say it!. I scrap in 8.5 x 11 (portrait). I use Photoshop Elements 6.0 and resize. Sometimes I have to take off a photo space or two, but, I have been able to use most of the templates by resizing. Thanks again for ALL of the wonderful templates! I tend to use alot of your templates... I love lots of pics. I use both doubles and singles but since I scrap rectangle I will delete a photo to resize. I also eliminate your shadows at times to do my own (in case I rotate etc). 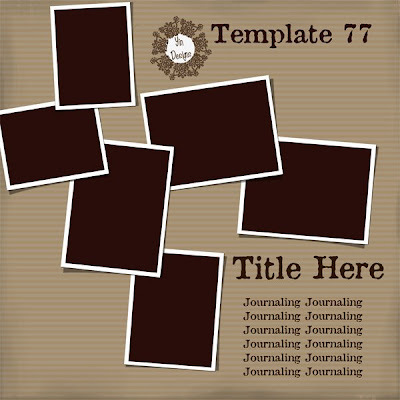 I really love all your templates, both the 2-pager and the singel pager. I mostly scrap 2 pages, but they don't have to be joined in the middle, so it is perfectly fine for me to use a single page template, and mirror it as the second page. Hi Yin!! Ok - for me? I LOVE your double layouts - but they're twice the work, right *grin*?? I haven't scrapped in a couple of weeks - have SO MANY photos to do ... our cruise, harvest, setting up for Christmas ... UGH!!! But I am teaching digi classes - one tomorrow night, in fact. So I guess if I'm teaching, I'm not scrapping *GRIN*!!! There's never enough time, it seems :-). i love your double pages because they give a cohesive look to a book layout. then, if i want a single page, i can use one side or the other. thanks for the latest template! Thank you! Your blog post will be advertised on the DigiFree Digital Scrapbooking Freebie search engine today (look for timestamp: 23 Nov [LA 09:00pm] - 24 Nov [NY 12:00am, UK 05:00am, OZ 04:00pm] ). Double ... definitely double (but I don't like to chop a photo in half between pages). Reason...because I can never take just ONE photo! 98% of my scrapping is double pages! TYVM for your wonderful templates! I always love your template- they look so good when completed! tfs!!! Thanks for the template Yin! I love your 2 pagers because they have so many spaces for pictures. I think a lot of designers don't "get" that "regular scrappers" (those of us who are scrapping events and not just layouts for CT requirements) have lots of pictures and can't afford (financially to print or time wise) to create a whole layout with just 1 or 2 pictures on it. Thanks again! Thanks for the template. I just started using some of the doubles and they are really cool. My biggest problem seems to be getting them cut evenly when saving them to send off for printing. But I'm easy to please. 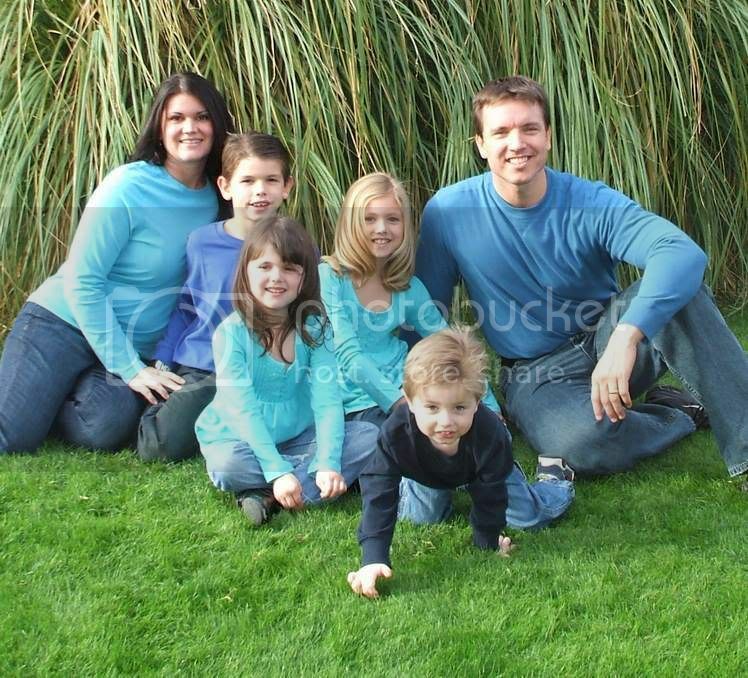 Love the 12x12 format. I love all your templates. And your layouts are great. I use both, just depends on the number of pics I am using. I do like your templates because you use so many photos. I take lots of pictures! I scrap events so my family can go back whenever they want! 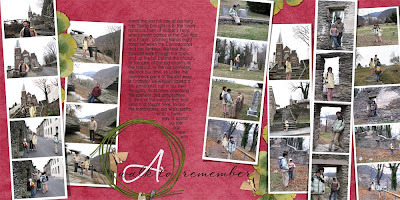 I love hearing, "Oh, I remember ...."
Thank you so much for the template. I like single or double, but if double, I like the option to use it as a single. Very nice layout as always. Thanks you very much. Thank you! LOVE your awesome templates!! I think double pages are cool, but I've only made a couple. I usually make single pages. Hi girl, I make an album with your templates, if you want to see it's on my blog ;-) TFS and TFL so much!!! Thanks so much! I prefer single page layouts since they are easier to work with and print. Thanks for the freebie! I love the doubles for my big events...the singles for the everyday fun stuff...how's that for a non-answer??!! 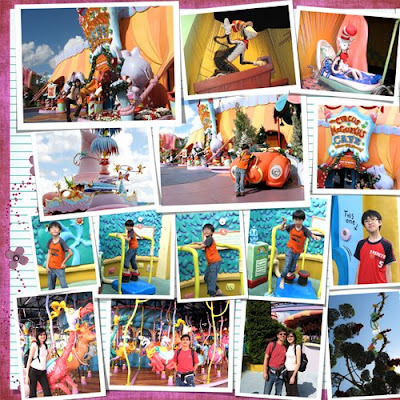 Great Seuss land LO.have fun in Japan! Doubles are my favorite. I like it when two pages go together perfectly. Double, double, double! Love your doubles! I am using LOTS of them in a China trip book right now. I prefer double pages. I always make double pages so I tend to look for templates that are for doubles. I am so glad to hear that you are finished with your pages documenting your trip to the States. 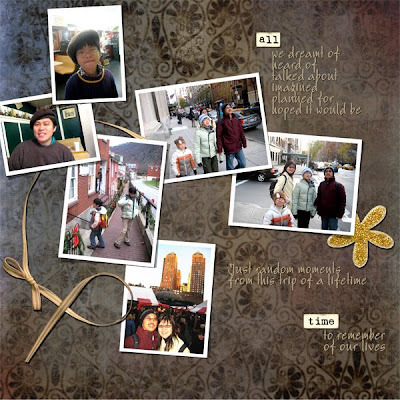 As someone who lives in the States, it has been so fun to see your photographs and yoru story come alive. You sure take a lot of pictures...you are a woman after my own heart. HA! who are you using to do your publishing for your book? Congratulations on your latest accomplishment. Holiday gift?? 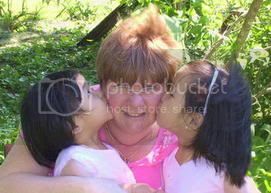 Just found your blog and I feel like I've struck gold. THANK YOU for multi-photo templates, and such great ones at that. I guess I like the double page templates best. Like others have said, then you have the option of making it a single page if you need it. Great template! I personally love both your single page and double page templates! The resizing to print on the double pages, can be challenging at times (thanks for the directions though). 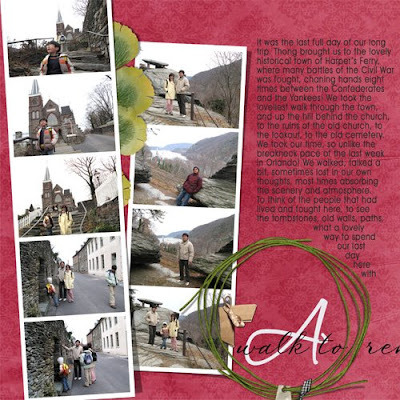 Most of my layouts are single page, but I've found with trips, double pages are wonderful! Thanks again for your templates!!!! I love your first LO!!!! I found your site via a friend of mine you have 'met' - Tawn! Thank you so much for sharing your templates. I am not new to digi-scrappin, but new to Photoshop and Elements. 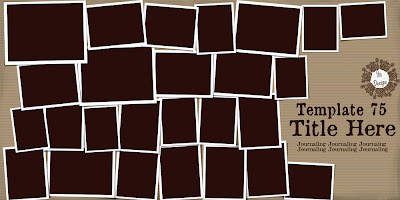 I was wondering if you could help me with how to replace your brown photo squares in your templates with my photos? Thx! Definitely double - apart from the fact that your templates are sensational - even 12 x 12 just isn't big enough sometimes! To think we all just used to look at 6x4's! Thanks for your generosity - I just love using your temmplates. Hi Yin, thanks again for more nice templates! 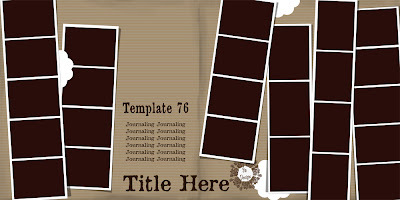 I wanted to give you some links as I have made two new layouts with your templates!!!! I love the double pages.. I take tons of photos, mostly on vacations, but really ALL the time, and your templates are a great way to scrap them. Plus I love being able to have my pages matching across from each other in my albums. Your double templates make that much easier. Thank you for another great freebie! I like both double pages and single pages. I tend to scrap more single pages though. I love that you make singles too though I could just use half of a double. I probably didn't help much with my answer. Where have you been *grin*??? Just letting you know that I've got some more pages up - and you'll see your familiar templates being used *grin*. Of course! You make fabulous templates. You are one of only a few designers who make double pages which I love. So please don't stop! They can be used as either a double or single page. Thank you for another awesome template! I prefer double - because you can use them together or separate. Thank you so much! Your work is a great inspiration!